When mentioning the underwater inspection system, what do you have in mind? There is no doubt that it would be the fields where this set of devices can be used, right? The underwater inspection system is widely used for underwater monitor, underwater reconnaissance, hydropower station, industry observation, ground water and exploration. And it can also be used to examine the underwater holes, underwater operation etc. One more function that would be ignored by most people is that the underwater inspection system can also be used to add more fun in your life. It can be a useful tool to help you in diving and fishing. People dive to watch more fantasy in the underwater world. Because the underwater world can be so different from the world on land. So more and more people are falling in love with the sport of diving by which people can explore the underwater world. But people can only see the world underwater when they are diving. They can record their happy hours and share their happiness with their friends. With the help of the underwater inspection system, they can make it. 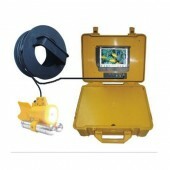 The underwater inspection system includes a Pipeline camera which can work underwater properly. You can record what you see and what you did when you are diving easily assisted by the underwater inspection system. What’s more important is that the camera is a high definition low illumination CCD underwater camera, which has night vision function and makes it possible to work underwater in dark condition. So you can dive to explore and record the underwater world at night and show off what you have seen in front of your friends. Many people enjoy fishing when they are free or on holiday. Fishing is relaxing and exciting when a fish is biting your hooks. But is can also be astonishing when the fish runs away after you tried to pick it up. Besides, it is very annoying when you pick some old shoes or trash after you take much effort to pick it up. So you may think that it will be very convenient to fish with a underwater inspection system device assisting you underwater. It means that you can see what is happening underwater when you are fishing. You can get ready when a fish is coming to your hook. You can see whether the fish is big or small when it is biting your hook, so you can decide whether you should use a piece of fishing net to help you get the fish. Also if the underwater inspection system device tells you that a old shoe is biting the hook, you can take measures to move the shoe and get ready for a fish at once.